I’ve been printing radishes lately. When shopping for radishes, I look for specimens that have nice, hairy roots and leaves that aren’t shredded and wrinkled—the opposite qualities from radishes to carve into roses or fling into your potato salad. I’ve discovered that grocers display radishes to feature the bulbs, meaning they’re resting on their leaves. It’s no wonder the leaves are so disheveled! Before printing a radish, I wash the whole bunch of ten or so in a bowl of cool water, let them air dry on a dishcloth, and refrigerate most of them. Two or three end up in a phone book (or other publication with uncoated-paper pages), with the leaves flattening gently for about a half hour as the bulbs dangle outside the pages. When it’s time to print, I slice the radish from top to bottom, allowing the now-flat surface of the bulb to occupy the same plane as the leaf stems and root. I often also cut the radish away from the leaves, printing the leaves separately from the bulb and root. With a dauber, I apply oil paint to the leaves (to the underside where the veined pattern is most prominent), the root, and the flat face of the radish. 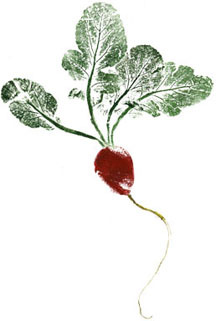 The painted surfaces are then pressed onto dampened paper to reveal the winsome character of the lowly, spicy radish. Asperity—sharpness, tartness, harshness, abrasiveness, acerbity, astringency, roughness, severity, sarcasm.